Breaking up hurts, and it will for a long time. Whether you are with someone for one month, one year, or one lifetime – losing someone that you love can be hard. Breaking up is mentally traumatizing, and knowing how to deal with a breakup can be daunting and overwhelming. No one handles a breakup quite the same way and different relationships result in different situations, but the one and only thing they all have in common – pain. 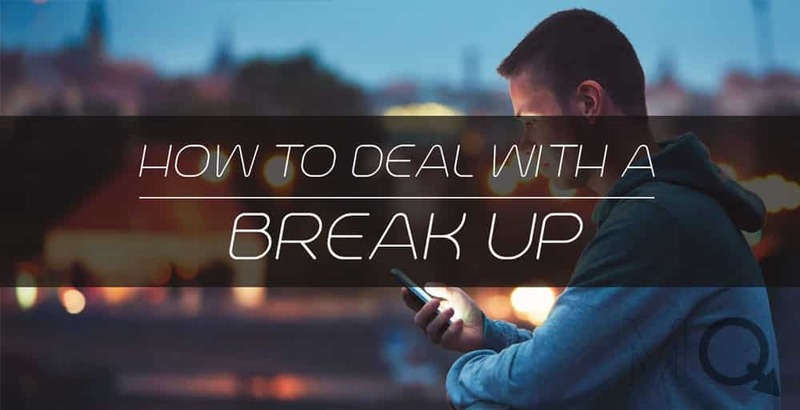 Knowing how to deal with break up is tough, which is why we want to walk you through the process. It may be one of the darkest times of your love life, but no one said you have to go through it alone. No matter how much you try to fight against it, you have to let all the emotions out. This means talking to a close friend, exercising, crying, or anything! Whatever is being bottled up inside, the best thing to do is to let it all out. I know how scary it sounds but it works. Talk to your close friend – tell them how much of a jerk he was! Party till you pass out, run until your legs turn to jello! Stay home, cry all night, as long as you are safe, do whatever you can to let your emotions out. This is your life and you are most definitely entitled to be sad. Once you let the anger and frustration out you will feel so much better. Right now the breakup may seems the most tragic event that has happened in your life, but the problem will grow smaller and smaller, before you can realize, it will be gone and only leave a tiny trace. After you break up, it is reasonable that your ex is the one thing that you are constantly thinking about. But the problem is, the more you think and dwell on the past about the memories you had together, or what you could have done differently, the more painful it is. This may be tough, especially if your previous days were all spent together with that person, and having that shock of emptiness and being alone can be jarring. But don’t allow yourself to stay put! It will only make your mind go crazy, and allow the feeling of loneliness to set in. Instead of being sad about your life alone, take the opportunity to enjoy it and be active! Treat yourself a nice dinner, watch a movie that you didn’t have the chance to, reconnect with your friends, or even pick up a new hobby like jogging or doing yoga. It might be hard at first, and you may feel like binging, watching Netflix with a carton of ice cream, and you may need to literally force yourself to get up and do something, but only by doing this, things will start to get better. Relationships teach us a lot. About What kind of person we want, but also the kind of person we want to become. A failed relationship is one of the most powerful ways to reflect on yourself and your relationships with other people, and gives you a huge opportunity to grow. In this time when you reflect on what went wrong, and as you start to gain a more level head about your own imperfections, you can start to live your life to build a “better you”. This might be building new, healthier habits, like being a good listener or being more spontaneous and romantic, and it might also be a time to get rid of some of the bad ones like checking your phone too often, or not being patient or sincere. Whatever happens, the best thing you can do is turn lemons into lemonade. If you strive to be better, then you WILL find someone better in the end. Look At The Bright Side – You Are Single! I am sure I am not the only one here, but when you are in a relationship, you sometimes meet a person who is so up to your alley and looks so delicious that for one second you almost forget that you are taken. I mean, I had that experience, not going to lie. My point is, now that you are single, and you might be like this for a while, why not make the most of it? You couldn’t flirt with strangers or dance with others, but now you can! Now you can go to wherever and whenever you feel like it. In another word, you are free. Yes, having a significant other is great, but when you break up with someone, you are going back to yourself without a boyfriend involved. It’s just you. This idea can drive lots of people crazy, and you might wonder was it really the right decision. People said when you are in a relationship, you can’t be sane, and I totally agree with that, sometimes all you need is a little space to truly realize what your desire is and to find yourself once again. This is the tricky part, and it differs from what kind of relationship you had. One of you might want to get back to each other. It happens to lots of couples, because most people enjoy patterns, which means new changes can easily freak us out. No one understands your own scenario better than yourself. Deep down you know what’s the best for your interest, and maybe you have faith for the both of you that you can work out the problem, or you think it’s the other way around. The advice I can give is really to just try and make the right decisions for your own good. Give it a good amount of time to think it all through, does this relationship worth another shot? Or has time passed that you remember the good, but have forgotten all the bad? No matter what happens remember this – break up or not, with or without a boyfriend, you are still the person you have known for your entire life. Relationships can make you grow, and the best thing you can do is take advantage of a bad experience and learn from your mistakes, who knows, the next person might not be as far away as you thought.